15M/Marea Granate Holanda : 13O GLOBAL NOISE! A year ago, the world was surprised by the rapid spread of square occupations calling for #GlobalChange. This Saturday we will take the streets again, louder than ever, with a global cacerolazo, casserole, potbanging protest. The initiative comes from the international networks of Occupy, Indignados, #YoSoy132, and now many grassroots groups and individuals joined: in hundreds of cities around the globe protests are planned. One common theme running through all the #GlobalNoise events is the targeting of political and financial elites who are held responsible for destroying our communities and the planet, resonating the ongoing wave of anti-austerity protests in Europe and around the world. 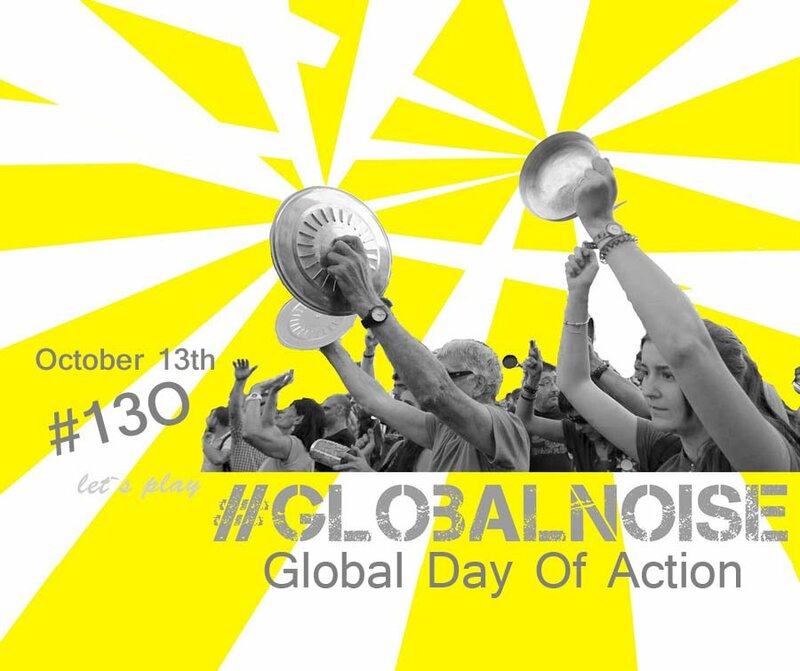 At the same time #GlobalNoise is a symbol of hope and unity, building on a wide variety of struggles for global justice and solidarity, assuring that together we will create another world. -14:00; Opening speech by Ronald Jan Hein, several speakers, music and celebration. -20:30 Film about Occupy Amsterdam from Sara Blom: 'Share Square'. Spanish Citizens, 15M/Indignados assemblies and various social networks and organizations around the country and abroad are building the Citizen Debt Audit Platform to demonstrate the illegitimacy of debt. In the Spanish state, as in other countries in the European periphery, we are witnessing a Debt Crisis used to justify austerity policies which are destroying social and labour rights won with the effort and struggle of past generations. With impunity, basic public services such as education, health and social services are being reduced and privatized. People are helplessly watching how retirement age is delayed, living conditions are made precarious, pensions freeze and labour rights dissapear. The Spanishs economy's debt is huge, above 400% of GDP, but, who subscribed and benefit from this debt? Is it true that we all have lived beyond our means, as we hear repeated over and over again? Or on the contrary, has this debt benefited a powerful minority that continues profiting from austerity? Are we paying a debt that we have not generated, a debt that is subscribed against people's general interest? Or is the mechanism designed to generate illegitimate debt in itself? Why have the States to cover the losses of private companies, such as banks, to protect the private creditors over the citizens? From the 15M Holland, we understand that there is more than enough evidence of illegitimacy in the debt that the Spanish Government, together with the EU and regional governments, is using as the reason to pull ahead with bleeding austerity policies. This is why we demand the right to know about the details of the process that led us to this situation. This initiative has, among its objectives, the need to recover democratic and sovereign power to decide what to do with the debt and with our future. Without any interference from financial markets, the European Commission, the ECB or the IMF. The audit will have a wide view; not just limited economic and financial issues; it will also include the role of the Spanish State as creditor of debt with countries in the Global South as well as considering ecological, gender, social, cultural, political and historical debt issues. Still defining objectives and strategies, networking, developing tools collecting data, the Platform is holding training activities and meetings, giving lectures in neighbourhoods, towns, communities, schools and groups of interested people; making materials available for citizen information and opening participation channels. Social mobilization is considered essential for the campaign's development. The platform has participated in various demonstrations against social cuts, the labour reform, general strikes, etc. As well as actions in support of the Greek people. The 15M Holland Platform will participate in 13O mobilizations denouncing the economic and financial policies that caused the crisis as well as the illegitimacy of the debt and the austerity policies imposed to us. We will use the social spaces created to celebrate the first anniversary of Global Noise to appeal to our people, regardless of their knowledge or experience, to participate in this process of collective learning and empowerment. Not one single euro more to rescue banks. Citizen's debt audit. We will not pay an illegitimate debt created by those who caused the crisis. #GlobalNoise is a moment to establish new connections, strengthen our networks and communicate our plans for the future. The coming weeks and months a large number of events are scheduled, including the Global Education Strike on October 18, movement gatherings in Madrid (Agora99) and Florence (Firenze10+10) in november, the global day of action for the Rights of Migrants, Refugees and Displaced people on December 18. And then there is an initiative from Montreal, Quebec, called VIA22 which is a global day of action planned for October 22 and continuing to occur on the 22nd of every month. The idea of VIA22 is to take potbanging to the next level by expressing the need that our marches and demonstrations become spaces for sharing knowledge about alternatives.